The Northern Rivers Branch of the ABA is based from Grafton to the Queensland border. The Northern Rivers Branch of the ABA is based from Grafton to the Queensland border. Many members live in the Lismore and Ballina area though the membership extends to Armidale and Urunga. This of course is a large area and depending on the location can mean 2 to 3 hours travel for some of us attending field days. 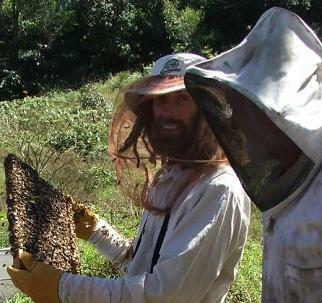 The club welcomes new members be they experienced beekeepers or new comers to the hobby. Newcomers in particular can gain great support from more experienced beekeepers. I’m new to beekeeping and have just lost one of my hives due to being slimed out by hive beetle. Photo taken by Geoff Manning last Wednesday 10th October just before the storm hit. It was hived into 3 full depth supers and an Ideal. After the demo we suited up and headed down to the apiary. The hives were very active with quite a bit of flora on display and a near perfect day to boot. This red soil country now grows a number of species of eucalypt that probably did not occur there originally. There is a lovely specimen of Spotted Gum on Lindendale Road, and Mugga Ironbark at the TV station. The Mugga is in full flower now. Naturally it occurs over the Main Range and further west. A major honey source flowering in the winter, but is another eucalypt lacking useful pollen. Our entry into the Colonel Pulling competition. The Red Gum that provided the photo of the flowers in the last issue has not obliged with anymore to date. However, there are a couple of others that are now flowering. Just to remind any newbies, Red Gum has excellent pollen, often making up the lack in Grey Ironbark in years they flower concurrently. The Ironbark should start flowering fairly soon.